Like many of Germany's post-war jazz musicians, pianist Paul Kuhn entered a seemingly life-long marriage when he began recording Schlager songs. He quickly became known as one of the country's most popular entertainers with silly songs such as "Es gibt kein Bier auf Hawaii" (There Is No Beer on Hawaii), and his passion for jazz music became a footnote in his career, to the point where jazz sessions he recorded were never released (for example, an album with Bill Ramsey, himself a jazz aficionado-turned-Schlager singer, recorded in the '60s). In the past few years, however, Kuhn has been revisiting his past and recorded several straight jazz albums that proved he was still a capable pianist. 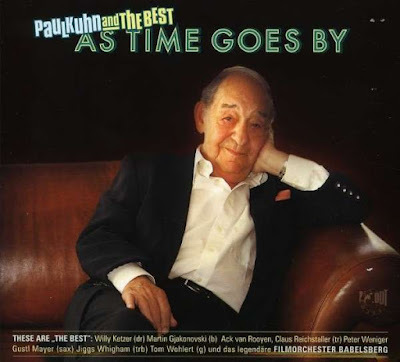 AS TIME GOES BY, released shortly before his 80th birthday, finds Kuhn with a large combo (called "The Best," no less) and the Filmorchester Babelsberg (Film Orchestra Babelsberg), performing popular jazz standards from past decades. The material ranges from the 1922 ("Limehouse Blues") to 1970 ("A Child Is Born"), with a new original composition by Kuhn ("Almost the Blues") thrown in for good measure. Kuhn's experience as a musician in the so-called Tanzorchester (dance orchestras) and swing bands that were active after WWII shows, as the emphasis lies on entertaining the audience with popular melodies, and, as they say, the music's "got that swing." "The Best" is comprised of several seasoned pros, and they keep everything going with breezy rhythms and a full, tight sound. Solos are brief but inspired (Peter Weniger's tenor sax solo on "Softly as in a Morning Sunrise" is especially noteworthy), and the record somehow manages to avoid sounding retro or stale. Kuhn sings three songs (among them "As Time Goes By"), and several of the songs are particularly sweetened by the orchestra. Sometimes, the music gets a bit sentimental, but at 80 years old, a healthy dose of sentimentalism is not only to be expected, but actually charming. Of course, nothing on AS TIME GOES BY is groundbreaking or overly original, but that's completely beside the point: the record is supposed to be fun and entertaining, and it's not only that, but it's a fine jazz session as well. This review was written for the All-Music Guide on April 11, 2008.